SKU: N/A. Tags: Fruit Punch, Fruit Punch Live Resin, Live Resin, Live Resin Monterey, Sativa Dominant Hybrid. Fruit Punch is a hybrid strain with a predominant sativa component of 80%. A breed from Heavyweight Seeds, Fruit Punch is the resulting strain from a three-way cross of Skunk, Haze, and Northern Lights. Fruit Punch is a flavor powerhouse. It has a sweet and tangy, almost sugary taste that is matched by a fruity berry scent reminiscent of candy or sherbet. Fruit Punch has its THC content between 18 – 25%. 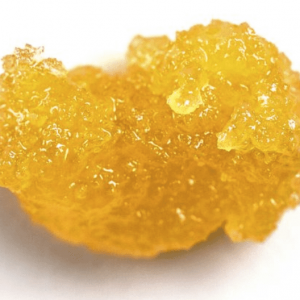 This live resin has effects that will be quickly felt, causing pressure around the eyes, cheeks, and fore area of the head. It delivers a rush of cerebral energy that can inspire you to take on any tasks, ranging from basic ones such as house chores to complex analytical work that require creativity and focus. This desirable mix of mental and physical effects enhances activities that invoke both body and mind. It is a perfect wake-and-bake strain, but may keep you overly active when used late in the night. Fruit Punch is a choice strain for patients with psychological conditions. It creates an intense and long lasting sense of focus that may help treat attention deficit disorders. It may also give temporary relief to patients of stress and depression. This strain may also help people suffering from chronic pain, cancer, fatigue, and loss of appetite. Long lasting relaxation from this Resin!! Quality stuff. Haven’t been this stoned in a while.